Home buying anxiety is a normal thing, especially if you’ve never purchased a home before. According to a recent survey by Fannie Mae, most buyers are under the misconception that getting a home loan today is harder than it used to be. Additionally, these survey participants were asked what they knew about down payments, credit scores and DTI (debt to income ratios) and many didn’t have the correct answer. Things are definitely much different from they were years ago. In fact, lenders, investment firms and banks are constantly making changes to keep up with the ever-changing economy. Here’s one change for instance for multi-families in one property. If you have other household members in your home you might be able to count their income toward your purchase with Fannie Mae’s HomeReady Program. Some buyers even may qualify for a low down or even a no down payment program through a VA or USDA loan. As you can imagine these loan types are very popular with first time homebuyers. 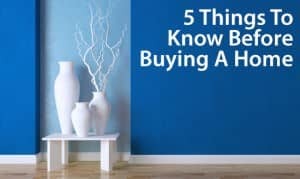 One of the first steps is getting qualified to actually buy a home unless you’re paying cash of course. The first step in the loan process is for a lender to look at how worthy you are as a buyer. The lender will review items like your credit (FICO) score, employment both past and present, taxes, etc. The lender will then issue a prequalification letter which tells sellers that you’re been qualified based on preliminary information to purchase a property based on the qualified amount. Keep in mind this is just a preapproval and not underwritten approval. There’s a big difference and that for another article. A nonprofit community development corporation named NeighborWorks recently released information that approximately 70% of adults in the US are unaware of down payment programs. Down Payment Resource is a company that maintains a database of down payment programs buyers can search for free. Much like buying a car you’ll be offered several approvals and most buyers, actually only 33% in fact shop for the best rate. Not shopping the rate from one lender to another could cost you literally thousands of dollars over the lifetime of the loan so take your time and get the best deal you can. There’s a saying in real estate “You make the money when you buy the property” so make sure you buy the property with the right deal and the right terms. When you own a home you will encounter costs that you wouldn’t normally if you’re renting. Now at first that may sound like a negative statement but keep in mind that many of these repairs are not only tax-deductible but can also go towards the appreciation of your property. The unexpected items like a plumbing issue, roof repairs or appliance replacement may catch you off guard if you haven’t properly budget for such future issues. As a general rule of thumb it’s a good practice to set aside three to five percent of the value of the property on an annual basis to help account for these surprise issues. For more information on reducing home buying anxiety, please contact us. We’ve help thousands of client buy and sell hoe with little or no stress in the process. We’d appreciate the opportunity to assist you as well.